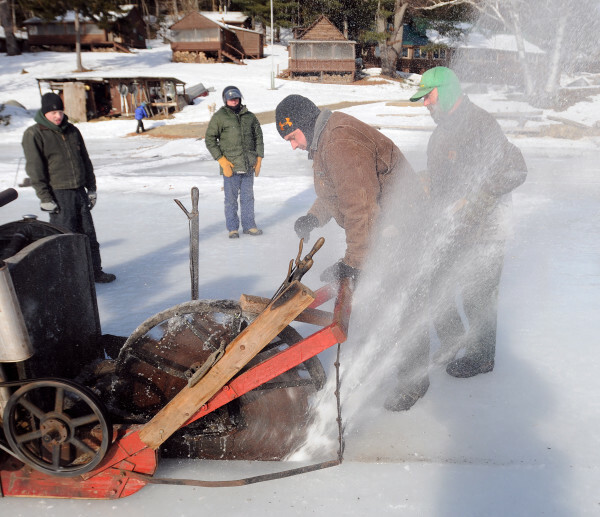 The ice saw is dragged by people as they make the initial cuts on the ice at Cobb's Pierce Pond Camps during the 2013 ice harvest. The harvest was restarted by Gary Cobb in the mid-1970s as a novelty and to provide some additional refrigeration for food and drinks at the camp. The Penobscot Bay Ice Co. takes advantage of one of the longest cold spells on record to harvest huge chunks of ice from Lilly Pond at Rockport on Feb. 2, 1961. Two men with poles prod floating chunks to keep them from re-freezing in the frigid water. The blocks, cut in 24-by-30-inch squares, are guided through open water to a lane leading to the truck. There, a block-and-tackle rig lifts them into the truck for transportation to Graffam's storage area. The company, which sells ice in Camden and Rockport, is harvesting its second crop of ice off the lake. 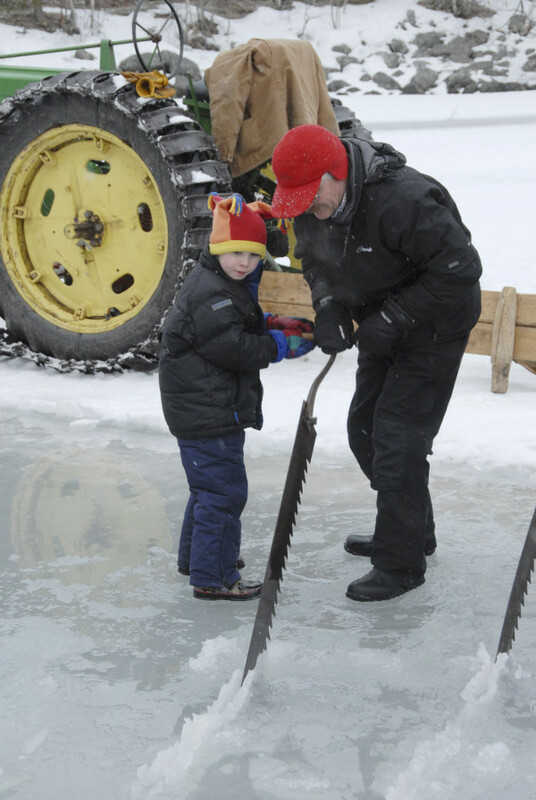 Scott Haskell of Bangor and his 6-year-old son, Jackson, push and pull on a vintage ice saw while helping cut ice blocks on Fields Pond in Orrington on Feb. 16, 2013. The Haskells were attending the fifth annual ice harvest sponsored by the Curran Homestead Living History Farm and Museum. 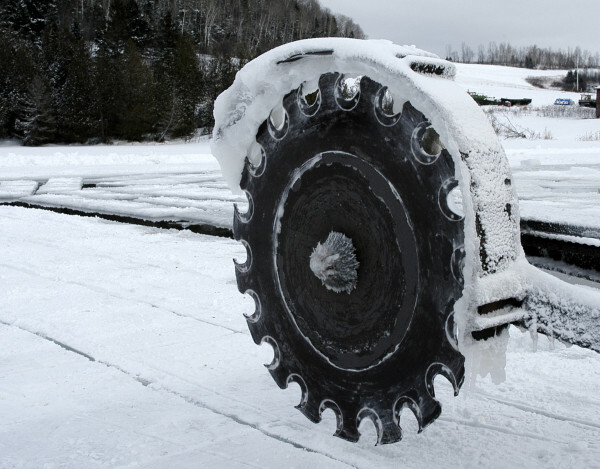 The 36-inch circular saw used during the January 2011 ice-harvesting operation on Little Black Lake sits idle. 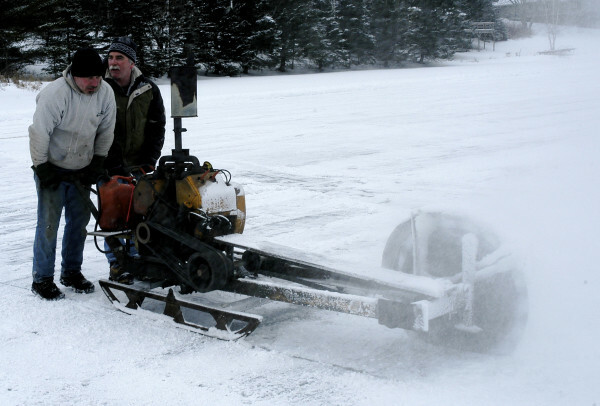 Kenneth Lincoln (right) explains the finer points of mechanized ice harvesting to Roger Morneault as the pair operates the giant circular saw over the frozen Little Black Lake in January of 2011. Lincoln brought ice-harvesting equipment from his Thompson Ice House Museum in South Bristol to help cut the more than 800 blocks of ice needed to create an ice palace in Fort Kent in time for the World Cup biathlon competition next month. 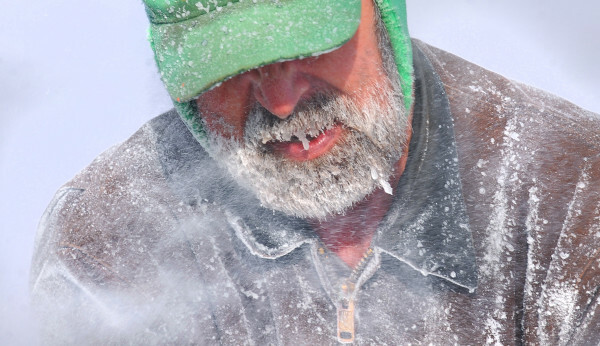 David Peppard of Eddington is engulfed in the fine chips of ice thrown by the ice saw while working at Cobb's Pierce Pond Camps in Pierce Pond Township in February of 2013. Peppard is one of the several guides who works at the camps during the fishing season and is a regular participant in the annual ice harvest. The ice saw throws a rooster-tail of fine ice chips as it cuts into the ice at Cobb's Pierce Pond Camps during the 2013 ice harvest on Saturday, Feb. 3, 2013. Camp owner Gary Cobb bought the machine from its original owner in Abbott Village. The machine is powered by a 1929 Ford engine and was probably built in 1929 or 1930. Tending to the cutting blade are David Peppard (right) and his son, Ike, (second from right) who has has been coming to the annual event with his father since he was a toddler. 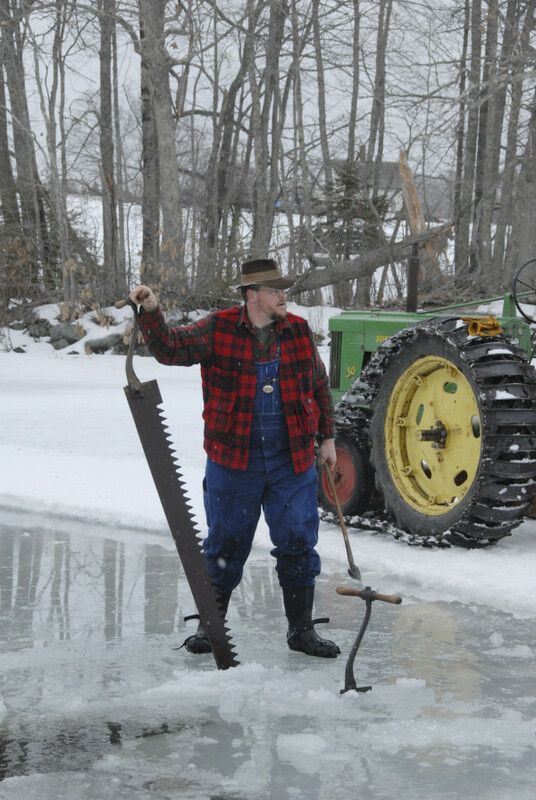 Bruce Bowden, director of the Curran Homestead Living History Farm and Museum in Orrington, stands with traditional ice-harvesting tools while overseeing the fifth annual ice harvest on Fields Pond in February of 2013. 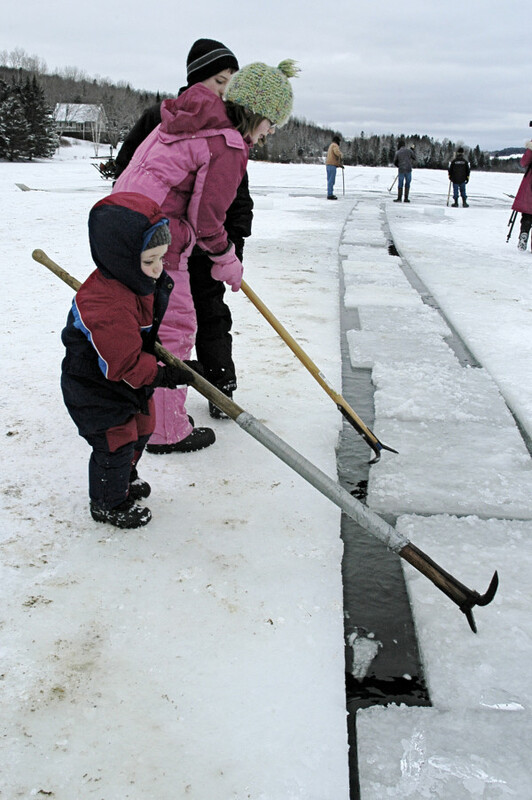 The ice blocks coming out of Little Black Lake in January of 2011 might have outweighed Ethan Malmborg by more than 350 pounds, but that was not about to stop the 3-year-old from contributing his small muscles to the project. The youngster was there with his 10-year-old cousin, Isabella, and the rest of his family to see first hand how ice harvesting was done in the days before modern refrigeration. "I'm glad we have refrigerators now," Isabella said. John Mugnai of Orrington lifts an ice cake from Fields Pond during a demonstration of traditional ice-harvesting techniques sponsored by the Curran Homestead of East Orrington in February of 2012. Volunteers load 400-pound blocks of ice harvested from Little Black Lake in January of 2011 for use as the building blocks of the Chateaux du Festival during World Cup biathlon in Fort Kent next month. 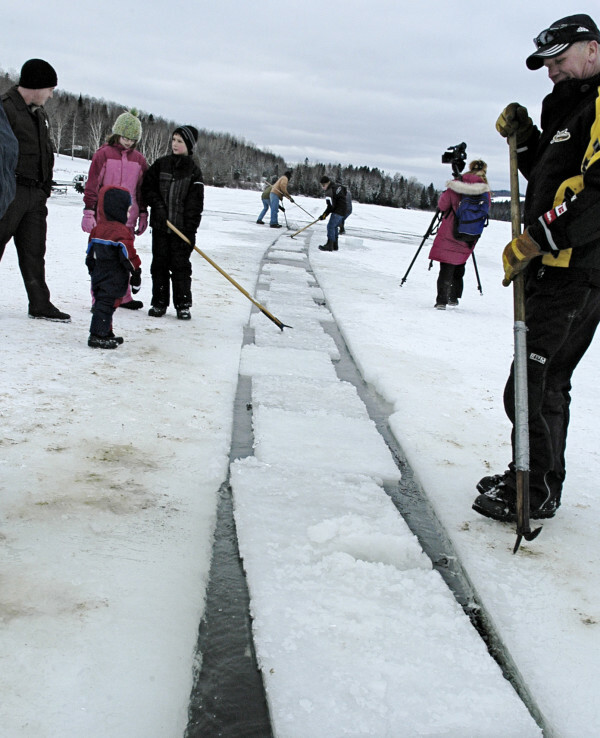 Young and old worked together on frozen Little Black Lake to harvest the 800 blocks of ice needed to construct the Chateaux du Festival in Fort Kent in January of 2011. In the days before modern refrigeration, there was ice harvesting. Ice harvesting was started on the Kennebec River in 1860 by New York retailer James L. Cheeseman. In its heyday, between 1870 and 1890, more than 25,000 men converged on the Kennebec River to cut and store ice. By the early 1900s, electric freezers and refrigerators were being bought by average americans. With people making ice in the comfort of their homes, there was no need for such a large-scale operation and antiquated operation. 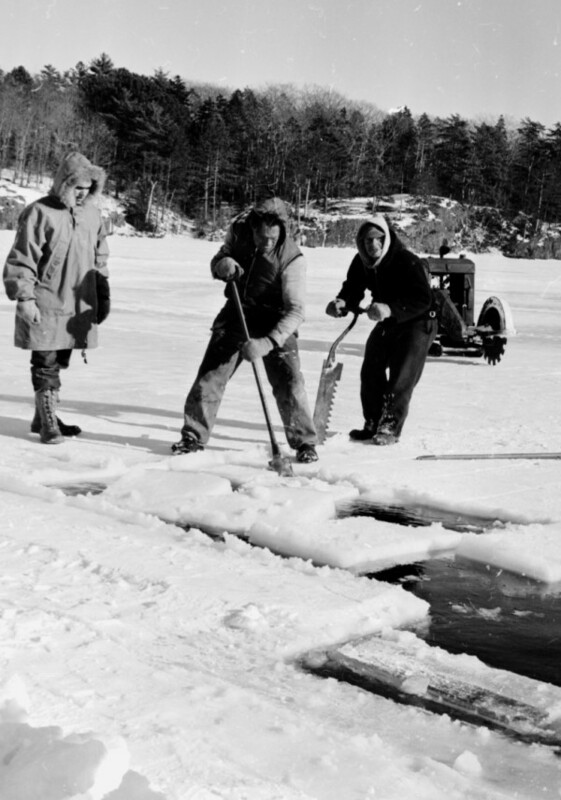 The Bangor Daily News captured ice harvesting taking place in 1961 by the Penobscot Bay Ice Company on Lilly Pond in Rockport. 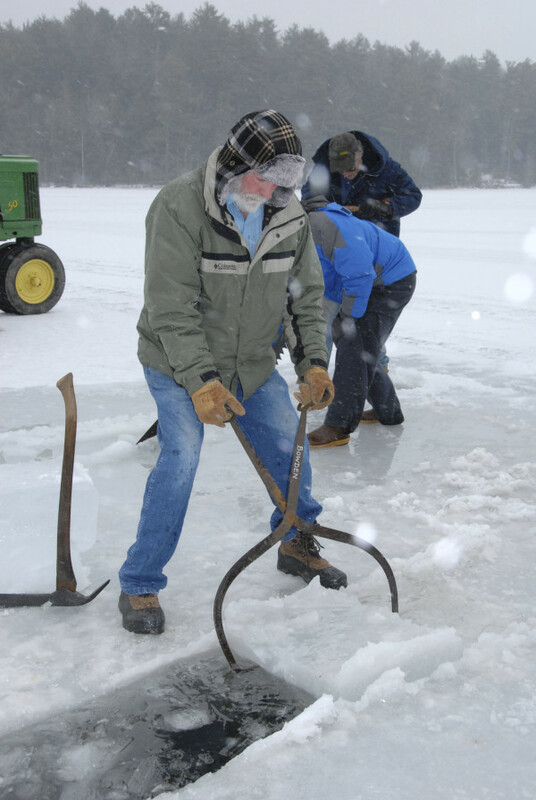 Ice harvesting was restarted at Cobb’s Pierce Pond Camps in Pierce Pond Township to provide additional refrigeration for food and drinks at the camp and to carry on the Maine tradition. The Thompson Ice House in South Bristol is a working museum dedicated to traditional ice harvesting. 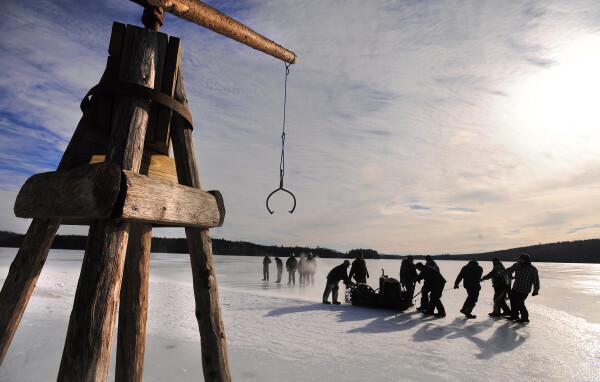 They hold an annual ice harvest, which this year takes place Feb. 15.